Walt Disney was fascinated with Rudyard Kipling's The Jungle Book, but the novel lacked a plot that would lend itself well to a feature film. After years of development and not being satisfied, Walt told his story department to throw the book away, which is how they ended up with this uniquely Disney telling of the story.. It was unintentionally the last animated film made under Walt's guidance and he passed away before it was completed. While Disney had previously used some recognizable celebrity voices in previous animated films, this was the exception, not the rule. This concept was turned around for The Jungle Book, where celebrity voices were cast and their characters were based around them. Singer, actor, and comedian Phil Harris was given top billing as Baloo in his first of several iconic Disney roles. Sebastian Cabot voices Bagheera, having previously voiced Sir Ector in The Sword in the Stone and narrating the Winnie the Pooh shorts. Jazz singer Louis Prima was cast as the swingin' King Louie. George Sanders voices Shere Khan, having previously stared in In Search of the Castaways. Sterling Holloway, who voiced more Disney characters than any other actor, plays Kaa. Clint Howard voices Colonel Hathi's son while Verna Felton, most famous as the Fairy Godmother in Cinderella and Queen of Hearts in Alice in Wonderland, voices his wife in her final Disney role. Colonel Hathi was also voiced by a recognizable Disney voice, J. Pat O'Maley, most famous for playing Tweedle Dee/Dum in Alice. Mowgli is voiced by Bruce Reitherman. One of Walt's legendary Nine Old Men, Woolie Reitherman, who previously directed 101 Dalmatians, The Sword in the Stone, and the Winnie the Pooh shorts. The film was in development for a while with Terry Gilkyson as the songwriter. When that darker draft of the film was revised into what was eventually made, the Sherman Brothers replaced him as songwriters. The only Gilkyson song that remains in the film is "The Bare Necessities." The retooling of the film also caused story man Bill Peet to quit his job with Disney. The vultures were created for The Beetles, but after the characters were designed John Lennon decided the band should not participate. The same song is in the final film ("What Friends Are For"), but the tone was changed to a barbershop quartet. King Louie was originally created for Louie Armstrong, but was recast with Prima. For this reason, some scholars claim the character is an offensive African American stereotype, but Prima is speaking in his normal voice and not doing an impression of anybody else. 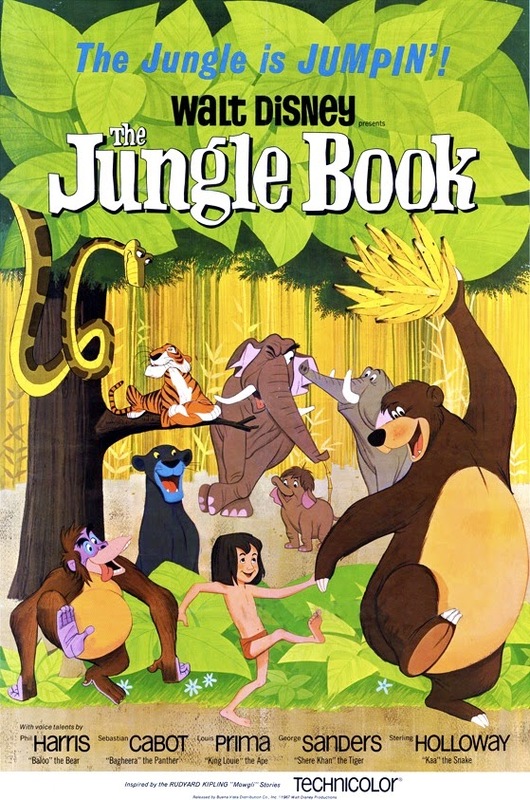 The Jungle Book was released on October 18th, 1967, paired with another Disney film, Charlie the Lonesome Cougar. It was a huge success, earning $13 million in it's original release. Critics agreed that the film was far removed from the novel, to the benefit of the film. Those that were harsh on the film claimed it was too easy going and didn't offer enough story. "The Bare Necessities" was nominated for Best Song at the Academy Awards. According to Gregory Peck, the Academy also debated about nominating the film for Best Picture, although it ultimately wasn't part of that category. The film was rereleased in theaters three times in 1978, 1984, and 1990. It made its home video debut in 1991 and was considered so prestigious that it wasn't aired on TV until 2011. I had the privilege of experiencing The Jungle Book for the first time in theaters during its last theatrical release. King Louis and the "I Wanna Be Like You" sequence had a big impact on me. Watching it today, it's still easy to get wrapped up in the characters. Jungle Book is light on plot, but heavy on fun and entertainment and that's why it has remained one of Disney's most beloved classics all these years. There are a lot of pop culture jokes that aren't relevant to modern audiences, but most modern audiences will miss the 1960's-specific references. This film has had a lucrative legacy for the Walt Disney Company. A television series based on the characters as pilots debuted in 1990 called Tale Spin that ran until 1994. In 1994, Disney made a live action version of the story that sees Mowgli become a man, plus a direct to video spin-off called Mowgli's Story. When Disney's Animal Kingdom opened in 1998, one of the original attractions was a show called "Journey into the Jungle Book" that lasted a year. In 2003, Disney Toon Studios made The Jungle Book 2, made by the same team that handled direct-to-video sequels. A stage musical based on the Disney film premiered in Chicago in 2013. The Jungle Book is currently available on Blu-Ray as a Diamond Edition. The film was fully restored and presented in widescreen aspect ratio of 1.77:1. The film was originally animated in fullscreen with the intention of being matted into widescreen in theaters. A Limited Issue DVD release from 1999 presented the film in fullscreen if you prefer the full animated picture. That release doesn't have any bonus features. The Blu-Ray features most of the bonus features from the 2007 Platinum Edition DVD (contains a making-of documentary, deleted scenes and songs, audio commentary, art galleries, and featurettes). But the new single-disc DVD is missing many bonus features, I recommend the Platinum Edition if you're looking for the film on DVD.